I made my first order from LM on June 1st, I used my credit card and my card was charged on June 3rd. I knew that things could take a while so I waited and waited, then again I noticed on my bank statement that LM charged me again on July 7th, yet I haven't received my parcel. What is going on, has my parcel been lost or something since it's been 6 weeks since I first made the order? And what happened to the parcel checker that was suppose to come up at early July? I really need my order as I need to remove a horrible person out of my life and I've ordered spell-kit! I know what you mean. I placed an order with LM and it took 7 weeks for it to arrive in New Zealand. What I have to add though is that the quality of the products is above anything else I have found on the market. The products are indeed worth the wait because you wont find better, more successful products, IMHO. I hope your order arrives soon. The thing is I'm in the UK and the shop is usually closed when I am awake and vice versa. Really and truly the problem is that I'm eager to put into practice what I've ordered, but if the results is as wished for, then I should hold on. But I really want the promised Order/Parcel- checker to come into work, because I know I'm going to put in future orders and I don't want to relive this all over again, even if I'm much wiser about the process. I placed an order on july 28th and I still haven't gotten anything in the mail yet. I did order it online. I was just wondering because I had it send to a family's house and they may not be home during the day now that school is starting up again soon. Jewel, if you're curious about where your order is, just call the shop. Everybody is very nice and whoever you speak with will be more than happy to help you. Keep in mind that, depending on what you ordered, it might have to be made up, so it takes a little time, but the quality of the product is unmatched by anything I've seen in 12 years. I may be lucky, but I have gotten my orders in about a month, so I've learned to plan WELL in advance when I need anything. Though the first time I ever called, I think I must have caught the gal on an off day, she was a teensy bit grumpy. It happens to the best of us. I found that it's better to order a few items at a time and just pay the extra postage. Also, plan ahead and start stocking up on things you know you'll need on a regular basis. I am super pleased with the boxes that have arrived though, and am working my way through the steps I need to fix these items...You all really pack a nice box!! They were very carefully wrapped and it took much strength to get into the boxes. I appreciate that very much. Thank you. As for my query, I am thinking I need to call the store to see which item(s) may be out of stock, to put my mind to rest. Yes, call the store. They will be able to help you. Thank you for the reply, Robyn. I will be calling....I'd be so sad if the first order got swiped in the mail or something. You probably just ordered things that need to be made. I get anxious for my orders too, so I know how you feel. I ordered A LOT of dressed candles. I placed the order a week ago, and called today to find out what the status was. I was told it was not shipped out, and that it will be likely to be shipped out at the end of the week. I would not have minded it if the girl would have told me that it will take a week per-candle. I am NOT concerned at all, since I have learned that quality is the most important thing in matters of craft. Patience is also key. I would rather get my order later, and it be potent; instead of the next day, and it not have any effect at all. The candles I have ordered to be dressed are all in regards to have the love and heart of a person I have loved for over five years, now. Intially, he wanted to marry me, but his family lured him to be with someone else. I walked away from the whole thing out of respect, but now the universe has led me to live in the city where his family lives. His family has gotten to know me, and love me dearly. I sense a bit of guilt in their dealings with me since they have gotten to know me. So, I am going to help the universe help me in marrying this man that I love so dearly, and whom I have confidence cares for me as well. My questions: It is my first time using LM, and I am new to this world of crafts...has anyone used candles dressed by LM? How have they worked for you? When would be the optimal time to begin burning the candles? (They are glass encased candles.) Would the night of a full moon be the best time? I am going to make an appointment with Catherine to read the glasses after I have burned them. Would it be better to have LM just burn them for me, and then go in for the readings? I was thinking if I burned them myself in my own home, it would add to the power since I want him to come to me. My last question: What spell have you found to be the most powerful in love casting? Thank you so much, and I am so glad I found a place that I could reach out to others who understand. Everyone here offered excellent advice. My orders normally arrive in about a month...but understand these are not a mass produced items...they are personally made...prayed over, packaged appropriately and of excellent exceptional quality, you will appreciate it and understand from your first order to your 2001 order...I know I have. If you have the candles burned by Missionary Independent Spiritual Church (next door to the Lucky Mojo shop) on their altar, they send you a written report, complete with what they read on the glass and in the wax. For bringing things to yourself such as love, money, etc. you generally work them when the moon is waxing (growing bigger, usually new moon through the full moon.) But as far as getting a reading, in my opinion anyway, it's never a bad idea. I got my big order of dressed candles from LM a few days ago. Oh My Goodness!!!! The smell is amazing! I kept one of the boxes because the smell reminds me of something very familiar. I am not sure what it is...I can't place it, but I have come in contact with these aromas before. I am a beginner, and to take the guess work out dressing candles I let LM dress them for me. I have begun a small part of my work already. I am glad that LM is here for us. Hi, I am interested in ordering a mojo bag but was wondering if there is some way to hide it so nobody can see or touch it when I go to pick it up from the post office. They always have to see it and examine it (no privacy) if they do then they will ruin it. Can you put the mojo bag in a teddy in a plastic container so I can avoid this situation? If you are interested in ordering a mojo hand from Lucky Mojo then my advice would be to call the shop and find out about how they mail their hands and what they can do to ensure privacy along those lines. The mojo bags come un-personalized, so there is no worry of it being touched by anyone. On top of that, it's usually inside a box of some sort - so it would be impossible for someone to touch it anyway. Unless you are international and worried about customs - in which case you're back to just not worrying about it since the mojo isn't finished when you get and so not in danger of being killed if anyone touches it. Stuffing it inside a teddy is just begging for customs to tear it apart wondering what is inside! Which brings up another question. How do you travel with a mojo? On the states at least you have to empty your pockets, luggage gets checked etc. Well prior to the recent change in security, you could carry it on you (pocket, purse, bra) but I have not traveled via airline since the recent events but search the forum there have been ideas provided when traveling with mojos. Also, for those who are concerned about what the post office people in a small town might think -- we can and do send things in "discreet" packages that do not say they are from Lucky Mojo. You simply have to ask for this in the "message" area of your shopping-cart order when you place it at our online shop. Speaking as a postal worker, we really don't pay much attention to who orders from where. Our interest is getting done. Hello, and thank you so much for your order! We make well over half of the items we sell, by hand, in small batches. This means that we cannot always, or even often, send out an order the same day is it received, unless it is composed entirely of items we *don't* make. Additionally, we fill orders in the same order that they are received. The only exceptions are in the case of a rush fee being paid to bump the order up in line (which we may decline to offer, at our discretion), or, as I mentioned, the order has only things that we buy and then re-sell. Our standard order acknowledgment email letter states that you can typically expect your package in two to four weeks, though it *might* come faster than that. Mail order companies that say they will ship faster are either much larger than us, or not making their own products, or are selling inferior products with few or no natural herbs and oils. Some may fall into all three categories. Our regular customers much prefer our products to the other companies', and are happy to wait a little longer for them. I hope you will find that you, too, prefer our products, and will have a little patience for them. As I stated earlier -- so well worth the wait! I recall reading somewhere on the LM Webpages that the oils, incenses, powders and bath crystals are made in lots of 8 (I think...) so as to ensure that each batch is given due attention in crafting. To think, each item is prayed over as it is prepared and assembled with so much care and thought for quality and tradition. HoodooDoll, when you receive your first order you will know exactly why it IS worth the wait! I am trying to get together a good inventory of items I use on a regular basis and stocking things I think I may need at some point as I am able to work them into the budget. I try to figure out what I will need for a month's worth of workings and order at least two-three weeks before I expect to need those items. I have just begun using LM products quite recently and already have favorite goods I can't imagine being without! Yes, I really need to start "stocking up" my conjure pantry too. There are things I consider ordering on whims, but then oils and incenses I just never want to be without! Yes, it's funny how I find myself passing over $80/oz. perfume in favor of my Attraction oil! The fragrance from the bath crystals is amazing and lasts from one bath to the next. My husband REALLY likes it, too. I also like to keep a good supply of St. Expedite incense on hand; he's my Go-To guy! Other things I can't do without: lots of candles; plenty of loose herbs/roots (I favor those which can be used for more than one type of working. ); and Chinese wash. I recently got the Parrot Botanicals #333 soap and it's very nice; I will definitely keep some in my medicine chest. Other goodies I look forward to getting VERY soon, based on the raves of other forum users: Fast Luck, 7-11 Holy oil, Fiery Wall of Protection and Crown of Success. I am also quite intrigued by the layered Double Luck special dressing oil/cologne. There was a post recently entitled "theory behind hoodoo oil formulation" or something similar wherein a link was given to a page where Ms. Cat gave a traditional recipe for this product; it sounds like it would smell delightful and it just looks so cool! I also recently spoke to someone at the shop regarding the Lucky Spirit black incense -- it sounds really nice to add in with resin/herbs to custom blend incenses. She described it as very warm-smelling, all purpose in formulation and nearly double the size of the regular incense packets. Ah, if only I were a rich girl! I usually recommend creating a magical cabinet or cupboard when one takes up magical work. If you use a dresser as your altar, consider using the drawers underneath to stock up on your magical supplies. Its always best to stock up in advance rather than need something in an emergency, but then wait for shipping . There is actually a post here somewhere with a list of supplies that people should begin stocking up on when they get into conjure. I highly recommend it. i have my stock in different pretty boxes, i have separates the oils, the sachets and herbs, and don't let nobody touch my boxes, i have all my stock in my private closet. i love LM products. I ordered the St. Expidite fixed bottle spell-I think the image of the saint on the bottle might be enough,Michelle (in addition to pound cake...& rum?...is rum a traditional offering,as well?). But LM does sell different types of prayer cards,as well as small plastic figurines of St. Expidite,I beleive. You sound alot like me-I am a Gemini,too. It's not easy for us to control ourselves,& our workings can sometimes contain "everything but the kitchen sink". We're curious & clever,& we can't wait to try out all of the options we've (usually) researched in earnest,as well as those that call to us spontaneously. Ah yes, I am a true Gemini and all the positive and negative that comes with it...I am innovative and look at things from many angles. I tend to approach my work from more than one direction -- like you, I do plan things out, but if I'm moved to change my plan at the last minute, I do. I am intuitive and pick up new information and ideas quickly. And I LOVE working with Saint Expedite; what better Saint for someone who likes swift action? Cleopatra commented he is attuned to my Mercurial energy and I thought that summed it up very nicely. As for the bottle spell, that's what I was thinking, too; that I would display the bottle as the image until I found a statue I really like to add to my altar. The prayer card I got from LM is pretty, but the plastic statue doesn't do it for me. (It sorta looks like he's wearing cowboy boots... which cracks me up, not exactly appropriate for revering one's favorite Saint.) If you would, please, describe the size of the bottle and give your impression of the quality of the painting -- a PM is fine, if you prefer. Thanks so much! P.S. Anyone who enjoys working with St. Expedite and would like to learn more about this most wonderful Saint, check out http://www.SaintExpedite.org. Call the shop, and ask if your order was shipped. I think they can request a signature at the time of delivery. Which means that if you are not home, they will take it to the post office, and you have to go there to retrive it yourself. That is what I had to do, and I had like four boxes. So, whenever you are in doubt in regards to an order, call the shop! Speaking from experience, I know that if you have a large order that they will send you a UPS shipping notification that helps with tracking. I believe they do this for orders over a particular weight limit, but my orders tend to be rather large so I get these notification quite a bit. Even if you didn't get a notification initially, if your package has been shipped, you can call the shop and ask for the tracking number. Once you get the tracking number, you can go the website of the carrier (either UPS or the postal service) and put in that tracking number and there's usually a place on that page where they ask if you want to receive e-mail notifications on the tracking status of that package and you can put in at least 2 e-mail addresses where you want tracking information to be sent. The St. Expidite bottle seems to have his image inside the bottle-there is a little window on the front,through which you can see it, but not very clearly (the bottle is small, just a few inches high). So the statue (or card) is a must,in my opinion. Thanks so much for giving a few more details about the Saint Expedite bottle. I really must get that soon; I've had my eye on that and the large red & black cross milagro to make a small shadowbox shrine for Saint Expedite on my altar. They way you describe it makes it sound very visually interesting. I appreciate the input! I've been waiting for my order for six weeks, is that normal?? Thanks! Depends on where you are from and if customs set your package aside for inspection. However, you need to call the shop. This forum is not run by LM employees, and does not fulfill customer service duties. You should call the directly with your inquiries in order to find out what's going on. Call the shop! Things get lost in the mail, foreign customs depeartments can seize packagaes -- CALL THE SHOP and ask for the shipping date and tracking number! Six weeks is kinda long but it depends on your location in the states vs. another country. Follow the instructions given and you be helped. The LM staff are great folks. My location is in Hong Kong and my order is quite large too so I thought maybe it's normal for the shop to have sometime for the arrangement. However, taken your advice I will call the shop these few days to find out the progress of the order at the moment. Thanks for your reply jwmcclin & Miss Cat. So I went to pay for my item that I have brought (BTW i ordered online). I got an email saying my Order number etc.. but I don't know if LM have received my payment. 1) Your email order confirmation is just that -- an order confirmation. It is generated automatically by our online shopping cart system and it assigns your order a unique number. 2) Unlike Amazon, we do not automatically charge your card. We have had too much card fraud for that. What we do is (A) generate a new client record for you or open your existing client record, (B) download your order to our database, (C) check your services for availability of items and "zero out" items not in stock, and then (D) visually check the order for major discrepencies, such as card holder name does not match name of person ordering, card holder billing address is in a different state or nation than ship-to address, or both name of person ordering and ship-to address are different than name of card-holder and billing address. If your card fails test (D) we give it a "flag" (fraud warning flag) notice, and proceed to step 5. 3) We try to run your card via our online merchant services provider. If your card runs, all is well and your order confirmation serves as your payment confirmation as well. Your order goes into the queue in the laboratory, where we will hand-prepare all the spiritual supplies you ordered and pull all the shelf-goods you ordered. 4) If your card declines, we get a code back of some kind from our merchant services provider. This is a letter from A to Z, and it specifies the faulty condition, such as billing address doesn't match card number, zip code doesn't match card number, security code doesn't match card number, insufficient funds, your bank doesn't support internet card usage, invalid card number, stolen card for pick-up at the terminal, etc. -- and we then send you a "decline notice" detailing what went wrong and how it must be fixed in order for us to run the card. 5) The flag notice or decline notice may be transmitted to you by telephone at the phone number you gave us on your order; we will leave a message if you are not there and the phone is hooked up to an answering machine or voice mail service. 6) If you are not in the USA, we may send an email with a decline notice or flag notice to the address you gave us. If the email bounces, we mark your order "invalid email." 7) Three phone calls or three emails is all we attempt -- usually over the course of 3 business days -- which might stretch to 5 days, counting weekends. 8) If you call back, we write down whatever corrections you have made to the card information and try to run it again while you are on the phone. If the order was flagged because the card holder name and name of person ordering are different, we require to speak to the card holder for authorization. 9) Be aware that every time we try to run your card, a hold is placed for that amount on the funds at your bank for 24 to 48 hours before the funds return to your available balance. (Your bank does this; we do not.) This can cause your bank account to go into overdraft mode, if you are ordering incorrectly from several stores and they are all attempting to run your card. 10) If the decline or the flag cannot be fixed, the order is discarded, and no further attempts are made to contact you; a permanent "DECLINED" notice (with details) appears in your database records, and after three such "unfixed declines," we mark you as a "problem customer." "This topic was posted in the "ask for help with your situation" section, but it is not about how to use magic to remedy or enhance your situation. It is a request for help with customer service, so it has been moved to the "General Lucky Mojo Curio Co. Matters" section of the forum. Please post your topics in the appropriate forum, to save time for your hard-working moderators, and to keep the forum easy to read for the rest of the community. Thank you." I'll start off by saying that, the products from LM is excellent once you receive them. It is going on 3.5 weeks and I am still waiting to get 2 bath salts and 1 incense. I know, everything is handmade...does it take over three weeks to put salt in a packet? I don't know if this is the right place to post my message...Sorry, if it is not. More than a month ago I placed an order and I havent received it yet. Not even an email confirming my order is being processed... I have called several times but probaly due to the difference in time ( I am in Europe) I always get the answering machine. I have left a message with the order number and havent heard anything yet. Is this normal? Please help, I need to start with my work as soon as possible. this is not customer service forum so you'd have to call the shop during their office hours. Set your alarm clock to wake you up. There is always someone at the shop to answer the phone. If you've left several messages with no luck...then the next thing to do is call and speak to a live person. Thank you Candis! I will call during the night here. Im in Sweden and I had a sizable order many months ago. It took around 8 weeks before I got it. That was partially due to customs as they had to mail me for content info before releasing the package. As Candis says, call the shop - they are open 9-5 every day, Pacific Time. If you get voicemail or a busy signal in those hours, try again, sometimes they do get a lot of calls. Also, you can EMAIL the shop. In this forum, we can advise you about Lucky Mojo products, Missionary Independent Spiritual Church services, and how to contact AIRR readers at the AIRR site. However, no Shop, Church, or AIRR staff will read your questions here, so it is pointless and useless to ask here about your shop orders or about church services that you have ordered, or to attempt to contact AIRR through this forum. This forum is run by volunteers. AIRR hosts a directory listing of certified practitioners. Each AIRR practitioner has an individual page at the AIRR web site that displays his or her personal contact and booking information. The directory appears along the left-side border of every page at AIRR. 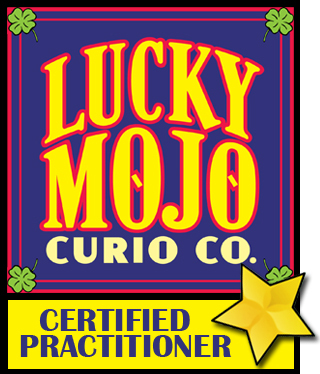 I think it might be helpful, especially to those folks who live out of the country and even in different states, to give you a customer's perspective of what Lucky Mojo Curio Company is like. I live in San Francisco, about an hour south of the town that the store is located in and I go up there pretty frequently. When you walk into Lucky Mojo the first time you are greeted the sweetest black dog named Sophie, a delicious scent in the air that can only be described as the Lucky Mojo smell, and friendly but BUSY staff members. All of the products fit into a relatively small storefront and every oil, incense, bath salt, mojo bag, and sachet powder is HAND MADE. I have never seen cat, who is always there and always working, ever try to do less than 10 things at a given time--seriously. They are beyond busy what with giving advice to customers, helping customers place orders over the phone, and hand-making and then praying over each product. On top of those things they are teaching, keeping the website up and running, and dealing with the various and sundry tasks that any small business owner must deal with on a daily basis. That is why their products are top of the line, because of the care that goes into them. Moreover, depending on what you have ordered, if its not in stock and needs to be made then the timing for making it might delay your order a bit--but again you are really getting what you pay for. I know that it is frustrating to wait for products but I just wanted to give folks on the forum who haven't had a chance to actually go up to Lucky Mojo a sense of what the business is really like. They carry high-demand products and part of what that means is that those of us waiting to get them sometimes have to wait a little longer than we'd like! Hi, can someone please help me with how to order rush shipping via the internet? It's URGENT and I'd like to get the order done tonight, plus it's past business hours so no one is answering the phone. The only way to get rush shipping is to telephone the shop during business hours and arrange it, as well as agreeing to pay for the service. Rush shipping is not available to all locations. Rush shipping is not available for all products. For these reasons, rush shipping is not offered as a standard clickable button at our web site. In the future, please direct ALL such questions to the shop. This forum is for customer service questions regarding the use of products. No member of the office staff or shipping department reads this forum.